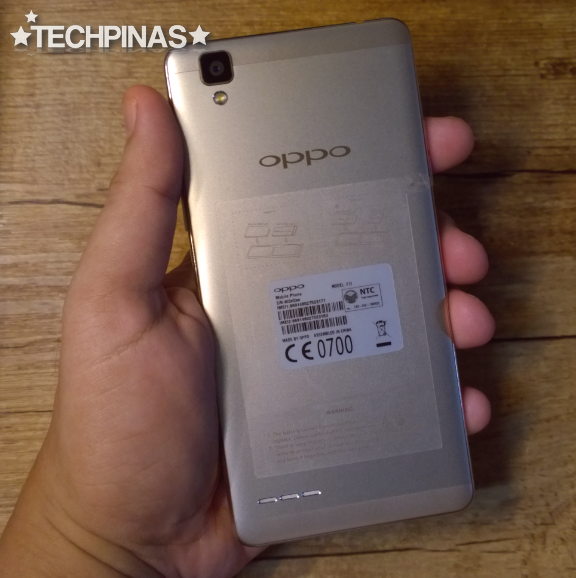 Chinese electronics manufacturer OPPO Mobile is currently very active in promoting this smartphone in the Philippines; You've probably seen it being advertised on PBA and via that new television commercial featuring Sarah Geronimo. Needless to say, OPPO F1 Selfie Expert is enjoying one of the biggest marketing budgets ever put on an singular phone model. But is it truly worth it? I'll dedicate a few blog entries to answer that question. But for now, let's do a quick unboxing and check out what you'll get should you decide to purchase it for Php 11,990 or to get it via Smart Postpaid Plan 1200. Here's the box. 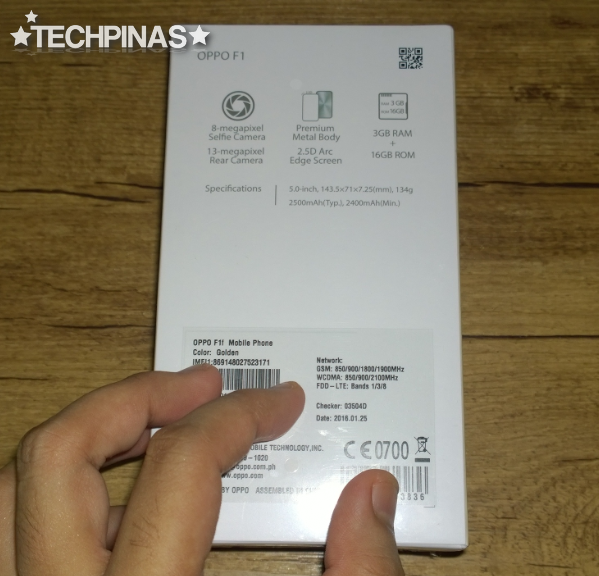 Protected by plastic wrap, it has an outer paper sleeve showing a photo of the device as well as a list of its key technical specifications. 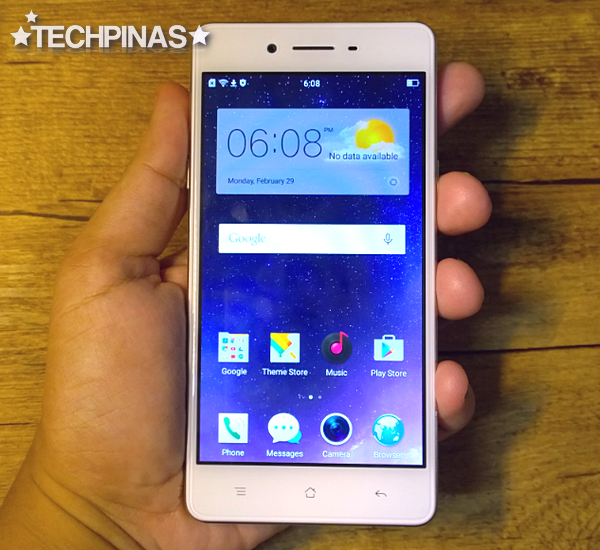 OPPO F1 is a mid-level release that's crafted for consumers who want a great-looking smartphone with stellar selfie-capture capabilities that doesn't cost an arm and a leg. [The handset] sports a 5-inch IPS HD display that's protected by scratch-resistant Gorilla Glass 4 touchscreen, a 13 MegaPixel f/2.2 autofocus camera at the back, Full HD video recorder, and non-removable 2,500 mAh battery pack. The highlight of this model, of course, is its 8 MegaPixel front selfie cam that comes with a slew of beautification features for users who love to take such shots. 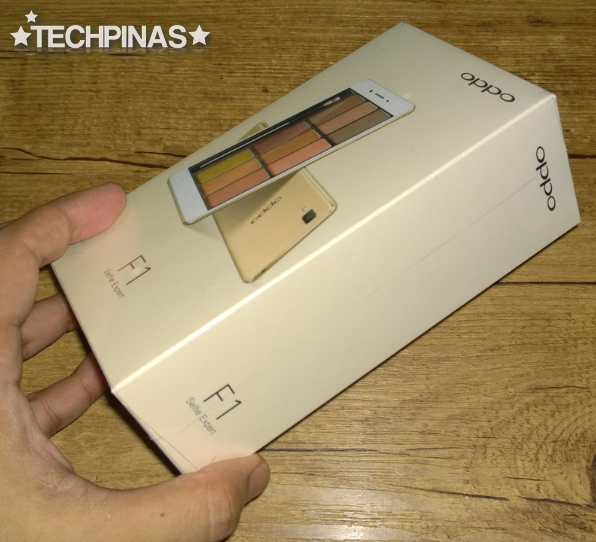 At its heart, OPPO F1 runs its Color OS 2.0 flavored Android 5.1 Lollipop OS with the new Octa Core Qualcomm MSM8939v2 Snapdragon 616 chipset that incorporates four 1.7 GHz ARM Cortex A53 CPUs, four 1.0 GHz ARM Cortex A53 cores and an Adreno 405 GPU, has 3GB of RAM (which is a treat at this price point), and comes with 16GB of ROM that you can easily augment using the secondary nanoSIM slot that also supports microSD card memory expansion. 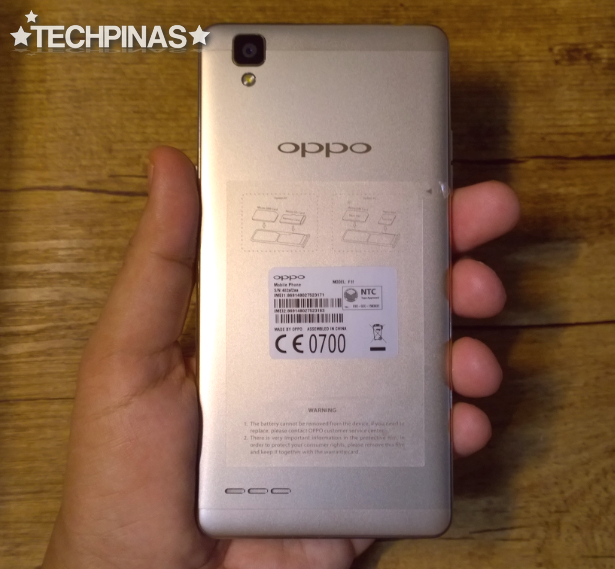 Pulling out the sleeve, we are greeted by the plain white box inside replete with OPPO's logo in front-center. Let's lift the lid and check out all the items inside. 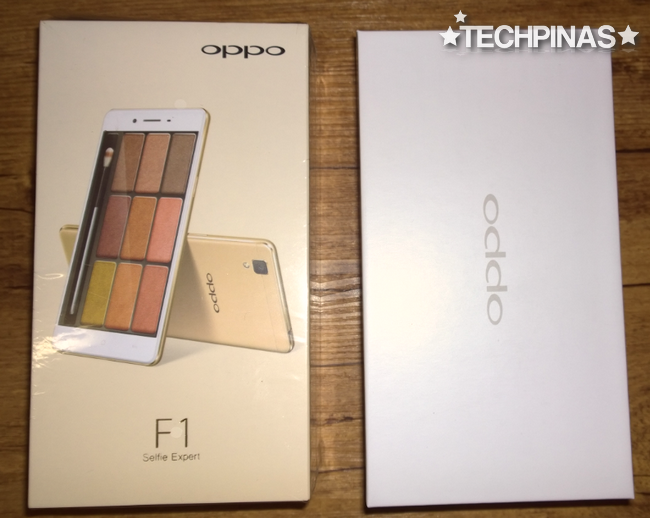 This is the complete OPPO F1 retail package. Aside from the unit itself, we have the Quick Guide and Important Information Guide booklets. 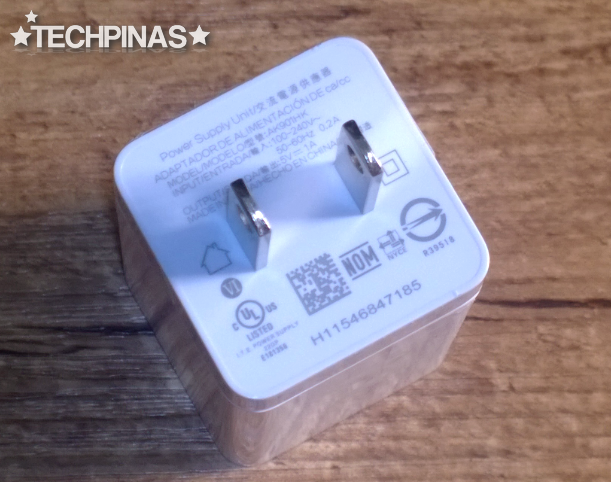 The included travel charger with 1A output. 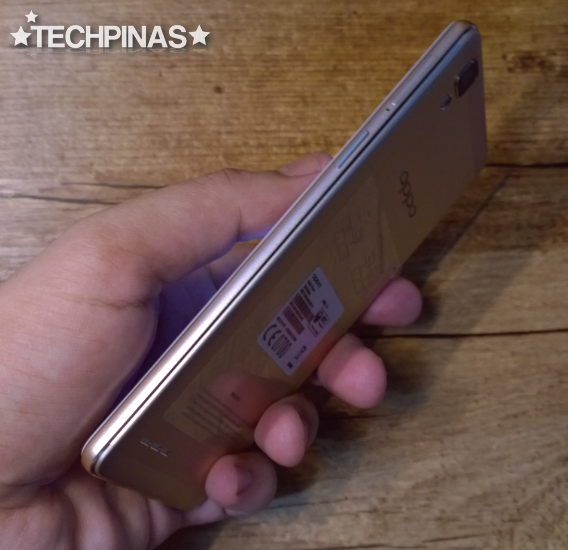 OPPO generously included a free soft silicone case to protect the metal shell of the phone against scratches and dents. 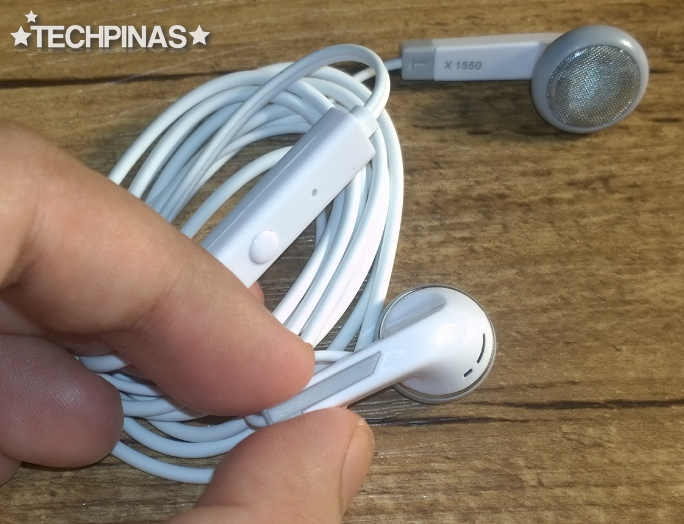 I've tried listening to music using the standard earphones (with microphone for calls) and I find that it's audio quality is almost as good as that of Apple Earpods. OPPO F1 is available in two colors; Rose Gold and Gold. I have the latter. The 5-inch HD IPS OGS display looks great regardless of the viewing angle. Touch response on the Gorilla Glass 4 screen is also ultra-smooth; One of the best I've experienced on a midrange Android smartphone. Oh, and for those who are wondering, the phone already has a pre-installed screen protector. The device's real metal shell houses the non-removable 2,500 mAh battery pack, which delivers more or less 10 hours of uptime with regular use. Thankfully, OPPO's Color OS 'experience' includes a Battery Manager in the settings letting you choose between Smart Power Saving Mode and Ultra-Long Standby Mode to get even longer uptime from the handset. The second option turns the device into a touchscreen feature-phone sans wireless connectivity that should allow it to stay on for several days. 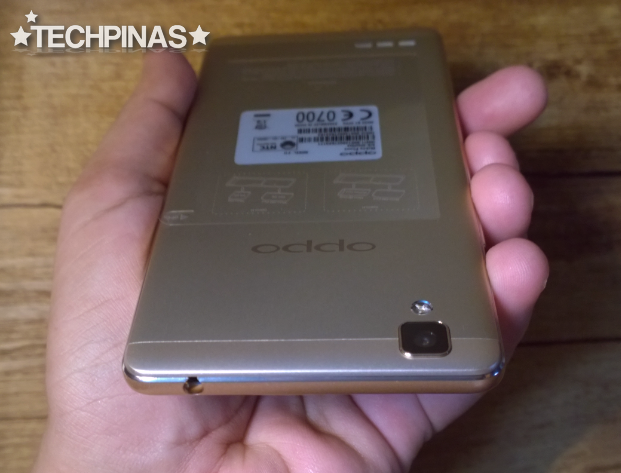 OPPO F1 flaunts this chamfered metallic accent that runs down its sides. 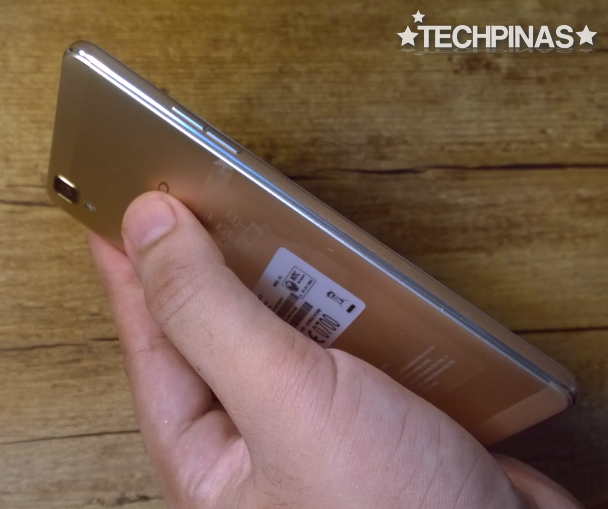 As you can see, the handset is very slim; In fact, it measures only 7.3 millimeters at its thickest point. 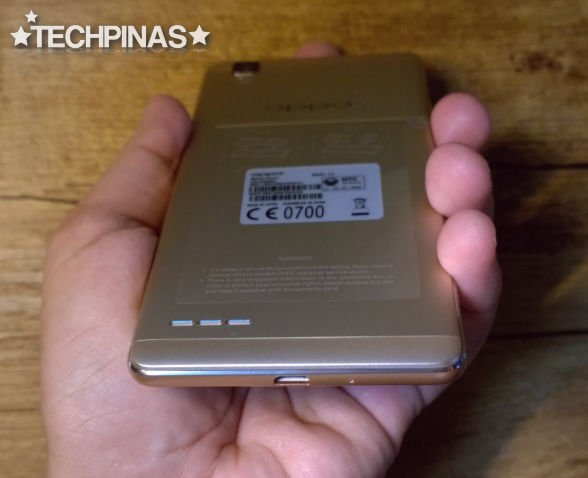 On the right panel, you will find the power button and the tray for the microSIM and hybrid nanoSIM slots. The volume up and down buttons are located on the left side. On the top end, you have the 3.5mm combo jack. The camera module with its single - albeit strong - LED flash is found near the top left corner of the back panel. The microUSB port is located at the bottom (which I like since it puts the cable out of the way should I want to use the device while charging) while the loud speaker is at the lower left portion of the back panel. 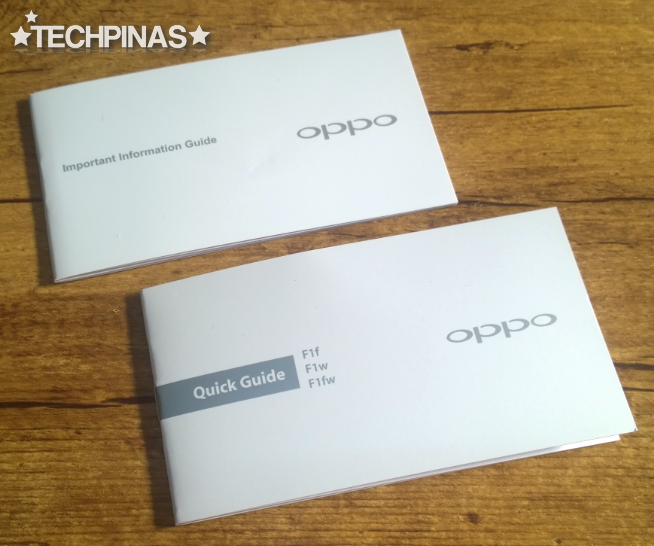 With dimensions of 143.5 x 71 x 7.3 mm, the OPPO F1 fits perfectly in my hand. I mean, I don't have to stretch my thumb all that much when I try to reach the top part of the display to unravel the notifications tab. Alright, TP Friends! That's it for now. 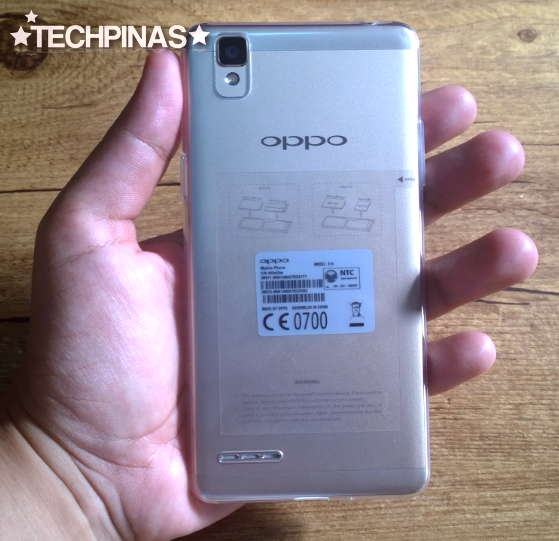 Stay tuned for my sample photos taken using OPPO F1's rear and front-facing selfie cameras! 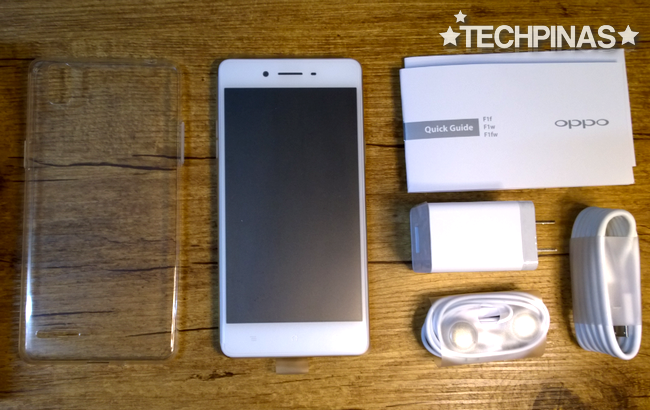 Meanwhile, you might want to check out the handset's complete technical specifications below. 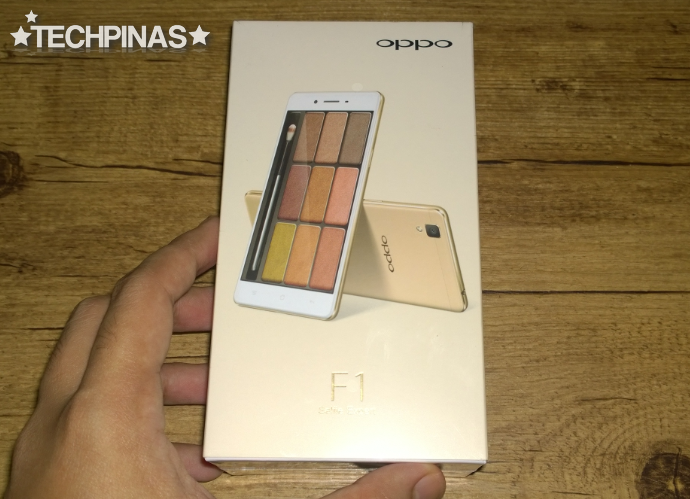 Oh and by the way, the Rose Gold version of this model is now officially available in the Philippines. 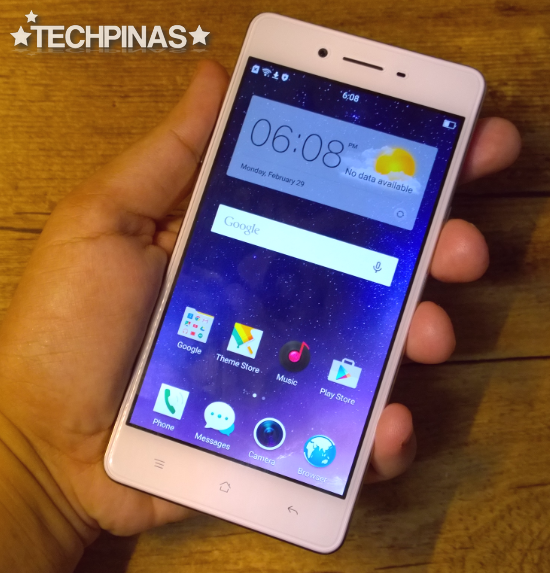 It also dons the same price tag of Php 11,990 and you can it for free via Smart Postpaid Plan 1200 and through monthly installment for as low as Php 1,200 via Home Credit. To quote our friends from OPPO, "The F1 comes with an 84-degree-wide angle front camera lens with f/2.0 aperture, and a 1/4-inch screen sensor that allows 40% more light to enter than an f/2.4 aperture lens. The F1’s camera hardware is paired with Beautify 3.0+, which removes blemishes and brightens your skin. This results in the phone’s front shooter working as if it has a built-in styling team that glams you up. 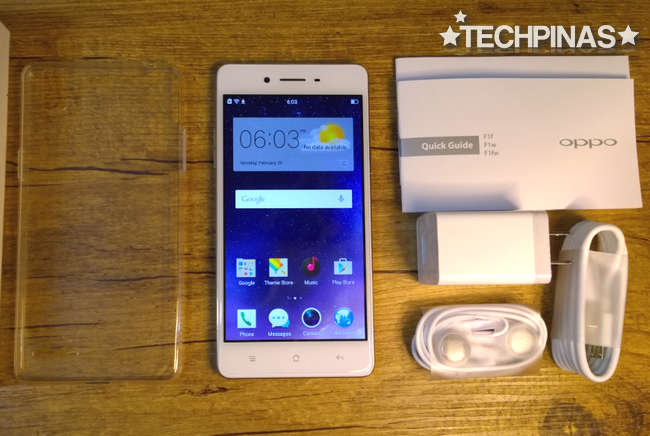 The OPPO F1 is not just all about the camera. Among its standout features are a 5-inch HD screen that is protected by a 2.5D Corning Gorilla Glass 4 coating and a durable and stylish back that has a velvet-like softness, achieved through putting the premium metal through as close to 40 polishing processes."